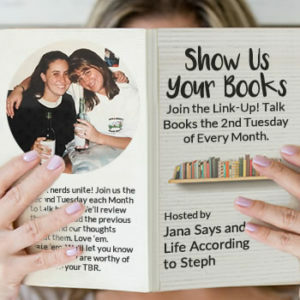 It’s time for another Show Us Your Books, where you share reviews of the latest books you’ve read. 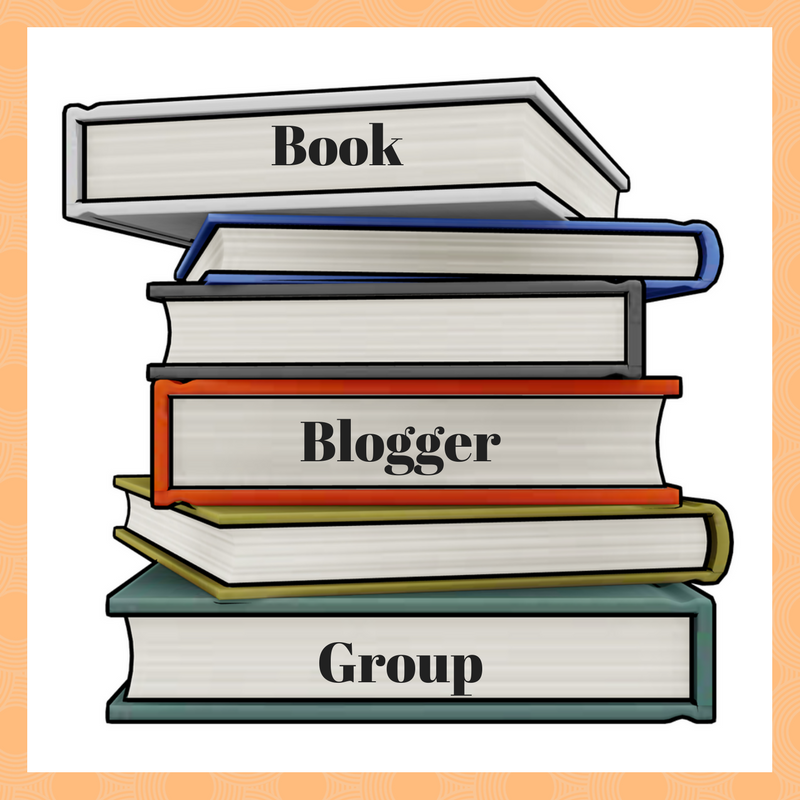 Since I do book reviews on my blog on a regular basis, I try and focus on those books I have yet to review, or I don’t necessarily have a ton to talk about. Link up with Jana and Steph if you want to join! Official Summary (add to Goodreads): This supernatural mystery set in the world of Sherlock Holmes and Lovecraft’s Cthulhu Mythos features a brilliant detective and his partner as they try to solve a horrific murder. I don’t know much about Lovecraft, but I’m a big fan of Sherlock Holmes so I was really excited to finally check out this graphic novel by Neil Gaiman. It’s a really quick read, but I found it fascinating. Since Lovecraft has been added to this story, it’s definitely not based in what we know as reality. This just adds to the intrigue, as Gaiman twists this story to suit his own imagination. There is a bit of a twist – or reveal, if you will – near the end of the book that I just ADORED! I’d be curious to see what others think when they read it. Official Summary (add to Goodreads): Neil Josten is the newest addition to the Palmetto State University Exy team. He’s short, he’s fast, he’s got a ton of potential—and he’s the runaway son of the murderous crime lord known as The Butcher. The Foxhole Court is actually the first book in a trilogy, and I’d heard really good things about it. I finally made time to read it earlier this year, and while I liked it, it wasn’t my most favorite. I’m still curious enough about the story to want to continue though. However, I felt the book was a bit slow moving and there is a lot of detail about the sport that Neil plays, which is called Exy. It’s not a real sport, so I found it kind of hard to follow or understand. Hopefully the slowness will go away in the second book, but we shall see! Official Summary (add to Goodreads): Theo Decker might be the lead singer of Riven, but he hates being a rock star. The paparazzi, the endless tours, being recognized everywhere he goes—it all makes him squirm. The only thing he doesn’t hate is the music. Feeling an audience’s energy as they lose themselves in Riven’s music is a rush unlike anything else . . . until he meets Caleb Blake Whitman. Caleb is rough and damaged, yet his fingers on his guitar are pure poetry. And his hands on Theo? They’re all he can think about. But Caleb’s no groupie—and one night with him won’t be enough. Riven is a book that I’d wanted to read for awhile now. 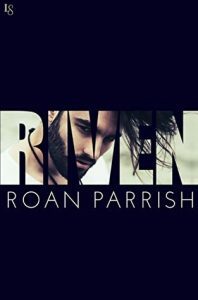 It’s an m/m romance about Theo Decker, lead singer of Riven, and Caleb Blake Whitman, a musician who has hidden himself away after leaving rehab and realizing that being around the music scene might do more harm than good. I thought the romance was done really well. I loved Theo and Caleb together, and I thought they were both able to help each other find their true happy. At the same time, it felt realistic. I wouldn’t say the book is angsty, but it does have some drama, but that’s to be expected. As for the music aspects, I loved it! I’m always a fan of musician/music-focused books. I really wish I could hear Theo and Caleb’s music for real! A companion novel, Rend, is out now, and I hope to read it soon. Official Summary (add to Goodreads): The Breakfast Club meets Pretty Little Liars, One of Us Is Lying is the story of what happens when five strangers walk into detention and only four walk out alive. Everyone is a suspect, and everyone has something to hide. I feel a bit like a broken record, but One of Us Is Lying is a book I wanted to read before it even came out. It took my book club assigning this for our February meeting for me to finally get around to it though! I really enjoyed the book, and I liked getting to know the four students who were all suspects of killing Simon. That might sound strange, but it’s easy to see why any of them would want Simon to go away. He ran an app that blasted people’s secrets, and the main characters in this book all have secrets. They are Bronwyn (the brain), Nate (the criminal), Cooper (the athlete), and Addy (the beauty). Yes, it really is like the Breakfast Club in different ways. They are all more than their “labels” though and I liked peeling back those layers. I had an idea of what truly happened – and most of it was right – but it wasn’t something I knew right away. In fact, I thought of it more as the truth was soon to be released, so I wouldn’t say it’s obvious, but even if it is to you, I think the non-mystery aspects of the book are just as good! Do any of these stand out to you? Have you already read any of them (what did you think)? I’ve actually read 14 books so far this year but I’ve already reviewed some and I hope to review the others in the future, which is why you’re only getting reviews for 4 out of those 14! Im not the biggest YA fan but One of us is lying was one of the best books YA books Ive read. It was really good! 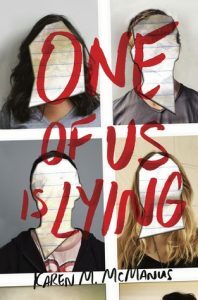 I read One of Us Is Lying and liked it! Really enjoyed One of Us is Lying and I have the second book by her on my nightstand to read asap! The Breakfast club is one of my favorite movies so I feel like I would like One of Us is Lying! One of Us is Lying was so fun, which sounds odd for a murder mystery but it was. 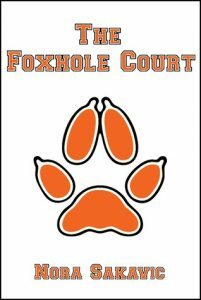 I’m sort of intrigued by The Foxhole Court. I might put it up for consideration. Loved One of Us is Lying! I have been wanting to read One of Us is Lying for awhile now. 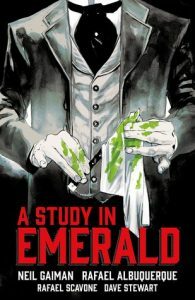 A Study in Emerald sounds interesting – I’ll have to check it out! i really liked one of us is lying – i keep meaning to read her newest book, hope it is as good! I so need to read One of Us is Lying. Some day. Some day. I will be able to say I’ve read it! LOL! A Study in Emerald also sounds fascinating. I love Sherlock Holmes, although Neil Gaiman and I aren’t best buddies. But I’m willing to give it a try! Tanya @ A Mindful Migration recently posted: January Bookshelf: 2 Books, Baby! I really really liked One of Us is Lying but I liked her new book a little more. Tiny bit darker, little less YA. I loved One of Is is Lying so much! It was such a delicious page-turner. I didn’t guess the ending so it kept my interest and I loved that it felt very much like Breakfast Cluv to me, too. Thanks for these recs—I hadn’t heard of the first Neal Gaiman book but adding to list! I think I need to check out A Study in Emerald! The Foxhile Court was a DNF for me. I just didn’t get it. One of Us is Lying is on my shelf. I just need to get to it. I agree about One Of Us Is Lying. Pretty good book! One of Us is Lying sounds pretty good. I might have to pick that one up. Looks like you’ve read some great books recently! I really liked One of Us is Lying as well. It was one of those books that had me questions who I thought had “done it” and I kept changing my mind (bc like you said, they all had the motivation). I ended up figuring it out though, which is unusual for me! I love a good rock star romance! Sounds like that is one I should give a try. The first book looks like one my students would enjoy as well. I am glad that you finally read One of Us is Lying, it was one of my favs for 2018. I think the Neil Gaiman looks fantastic as well. Happy reading! I need to read One of Us is Lying! I have it on my shelf and have yet to pick it up! That Gaiman graphic novel sounds great!! Ooh I’ve also been wanting to read One of Us Is Lying, but I haven’t yet gotten to it yet. I hope to soon, I hear such good things! One of us is lying sounds really good. I need to check if it is on my TBR list, if not I’m adding it. I’ve heard mixed things about one of us is lying so still unsure about it. I hadn’t heard of A Study in Emerald, but it sounds fab. It’s on the list. The others are all ones I’ve heard of. I want to read Riven and One of Us Is Lying, too. Great list! I love the blog title as it made me giggle a bit. The double entendre (almost). A Study In Emerald is one I would enjoy! I am such a fan of One of Us is Lying and McManus was tweeting teasers for the sequel today!!!!! Ooh, the first and the last one sound fabulous! I am going to grab One of us is lying right now! I should have DNFed The Foxhole Court. I thought it was confusing and silly. I’m glad you liked One Of Us Is Lying because I’m on a waitlist for it. Everyone raves about The Foxhole Court but I think readers are probably put off by the basic cover unfortunately. I have a copy as well that I just haven’t had the chance to read as yet so really looking forward to seeing what you think of it Lauren! I really loved One of Us Is Lying! I can’t wait to pick up her newest book! Especially since I heard it’s less YA and a little more dark! I’m so glad you enjoyed One of Us Is Lying. That one was such a good read for me too.